...with Steven Hobert at the piano. 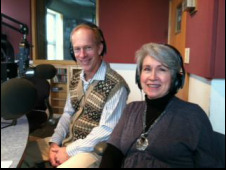 Joey and Connie interviewed on KFAI radio! 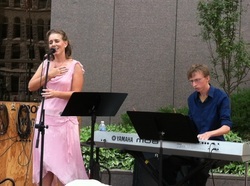 Lovely Sheridan performing a summer outdoor concert at the Hennepin County Government Center plaza featuring the music of Bette Midler accompanied by frequent collaborator Steven Hobert. Jordan Daoust, sound tech extraordinaire, moderated a great afternoon about microphones for TCCAN Members in June 2014. We talked everything about mics: from types best suited to vocal settings and how to avoid feedback to tips on tapping into a venue's sound system.